I’m proud that I’ve spent my career in financial services working to help people. Often companies in this industry are wrongly associated with Wall Street stereotypes — fast-talking, slick suits, backroom deals, and number crunching. That’s not the world we live in at Fidelity. Our core mission remains unchanged: we have a steadfast commitment to our customers (everyday people of all walks of life) to help them manage their savings and investments with a transparent, value-added approach so they can live the lives they dream of. There’s no time more exciting than now to work in financial services. It’s fast-paced, innovative, mission-driven, and in the midst of massive transformation. So why is our industry facing a talent crisis? I believe there are several myths and misconceptions about financial services that prevent outstanding people from pursuing this dynamic industry. Investment knowledge is no longer a pre-requisite for financial services. These days, communication skills, problem-solving abilities and ambition outrank investment, market, or product knowledge as desired traits for hiring managers[i]. Some customer-facing roles do have license or certification requirements, but many firms such as Fidelity offer programs to get employees up to speed on what they need to know. They also offer benefits like tuition reimbursement for people who want to pursue advanced certifications like the CFP. Bottom line, you don’t need to be a financial guru to be a good fit. It’s actually not only about sales. Today’s investor doesn’t want to be sold a product; they want to create a holistic financial plan that’s tailored to their life and their needs. They want guidance, solutions, and a trusted relationship to help them do what’s right. This trend represents a big change in what today’s investor is looking for from their financial service provider. In fact, for new financial advisers entering the field, only 8% of them correlate their role with sales, while 62% correlate their role with financial and investment planning, and 30% with relationship management[i]. In addition, there are a wide range of other professional roles to consider in financial services and many offer terrific growth opportunities. For example, 25% of Fidelity employees work in technology, and that will only continue as the industry gets more and more digitized. Other critical roles include data science, digital design and production, user experience design, solution delivery, finance & accounting, marketing & communications, and more! In addition, firms like Fidelity offer great ways to give back to the community. From company-sponsored volunteer events to grant-matching programs — finding a company that aligns with your values can provide the opportunity to give back in powerful ways. I’ve seen first-hand the incredible progress women have made in the overall workforce and in financial services. We have amazing women at all levels of Fidelity who love what they do and are building strong, purpose-driven careers in the process. I’m inspired every day by the women I work with. Women continue to build skills that translate well to the new workforce. Since the late 90s, women have earned 57% of all bachelors’ degrees and about half of those have been in science and engineering[iii]. For aspiring financial planners, women naturally command many of the capabilities needed to be successful — from relationship management skills to the ability to deliver insightful and compassionate education and guidance to clients. From a customer standpoint, the industry is experiencing a seismic transfer of wealth. By 2020, women are expected to control $22 trillion in personal wealth[iv]. Studies clearly show that women who have a gender preference overwhelmingly prefer to sit down with a female adviser[v]. 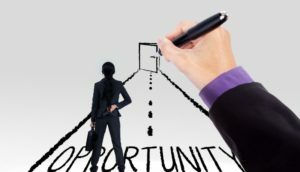 The opportunities are boundless! As firms compete for new talent, there are exciting changes happening in the workplace and it’s a great time to join an industry that’s undergoing such a massive transformation. If one of these myths is holding you back, take some time to explore what’s available and look for a company whose culture and values match yours. If you’re eager to move forward, here are three steps you can take. Whether you’re looking for your first job or your last one, a career in financial services is full of opportunity. Views expressed are as of February 25, 2016. Unless otherwise noted, the opinions provided are those of the author and not necessarily those of Fidelity Investments. 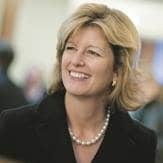 Kathleen Murphy joined Fidelity in 2009 as President of Personal Investing, a business that provides millions of individual investors with investment services such as retirement planning, college planning, estate planning strategies, retail brokerage & trading services, and cash management offerings. Personal Investing is a leading provider of offerings such as mutual funds, IRAs, ETFs, college savings plans, and many more. Ms. Murphy also oversees Fidelity’s life insurance and annuities business, its workplace savings business for tax-exempt organizations, all of the firm’s brand and advertising programs, its online strategies through Fidelity.com, and Fidelity’s mobile device applications. Prior to joining Fidelity, Kathy was CEO of ING U.S. Wealth Management, leading the Defined Contribution, Defined Benefit, Retirement Solutions, Annuities, and ING Advisors Network businesses. Ms. Murphy began her career with Aetna, spending 15 years in a variety of legal and government affairs positions, eventually serving as general counsel and chief compliance officer, Aetna Financial Services. Kathy sits on the Board of Directors and Executive Committees of America’s Promise Alliance and the National Football Foundation. She has been named one of the “50 Most Powerful Women in American Business” by Fortune magazine, one of the “Wall Street Top 50” and “Business 100” by Irish America magazine, and named as one of the “25 Most Powerful Women in Finance” by US Banker, among other honors. For more information on careers at Fidelity, please visit WomenInFinance.fidelitycareers.com.